For this week, we had a really interesting yet weird poll on WebUpd8: we asked you what is the most awaited Linux project of the year, with the poll options including Opera 10.60 for Linux (released today), Ubuntu 10.10 Maverick Meerkat, GNOME Shell, Steam, The GIMP 2.8, uTorrent, Chrome OS, VLMC, Blender 2.5 and Firefox 4.0. If the first place was something we were expecting, there are some interesting results. Read on! Steam for Linux won the poll with 24.21% (443 votes) and on the second place came GNOME Shell - 13.99% (256 votes). I said it on Facebook and I'll say it again: reading the comments to practically all our GNOME Shell posts, people say they hate Shell yet it seems most people (it's not a majority but considering the many options the poll had, it's still a really big number) can't wait for GNOME Shell to be released. This I don't understand! Not surprisingly, Ubuntu 10.10 Maverick Meerkat came in third, Firefox 4.0 on the fourth place with The GIMP 2.8 close behind. 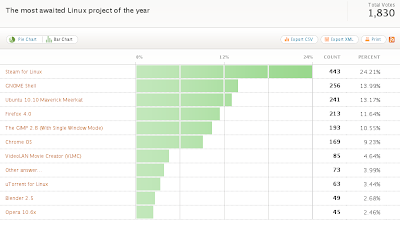 Maybe not as interesting as GNOME Shell results, but the number of votes received by uTorrent is also something worth mentioning: 3.44% (63 votes) - only Opera 10.60 and Blender 2.5 getting less votes. So Linux users (at least that's what I though) complain they don't have uTorrent for Linux but don't really want it. I do agree with the number of votes uTorrent got though: we have enough (and at least as good) Bittorrent clients for Linux already. Among the "Other" answer you entered, there's one which stands out (and got quite a few votes! ): Manhattan OS, an Ubuntu based distro which looks astonashing and includes most of the applications and tweaks we post here, at WebUpd8. Have a poll idea? Let us know in the comments!